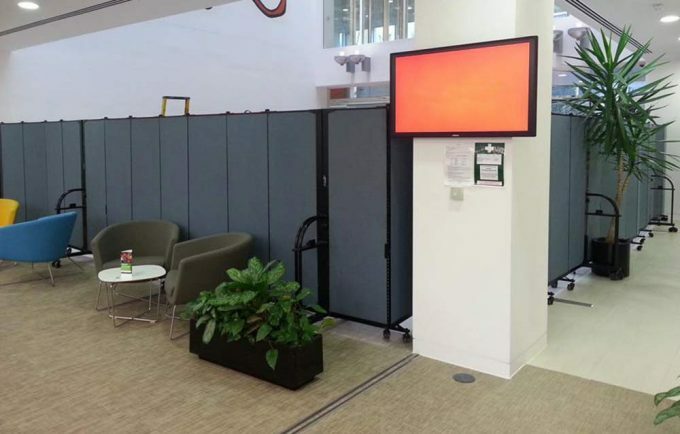 For over 25 years Screenflex Portable Partitions has been designing and manufacturing room dividers that provide space-saving solutions for facilities around the world. With some modifications to the original “cabinet” design, the Standard Room Divider emerged as the best-selling product for most industries. Several years later, the concept for a heavy-duty divider was created for more industrial environments. 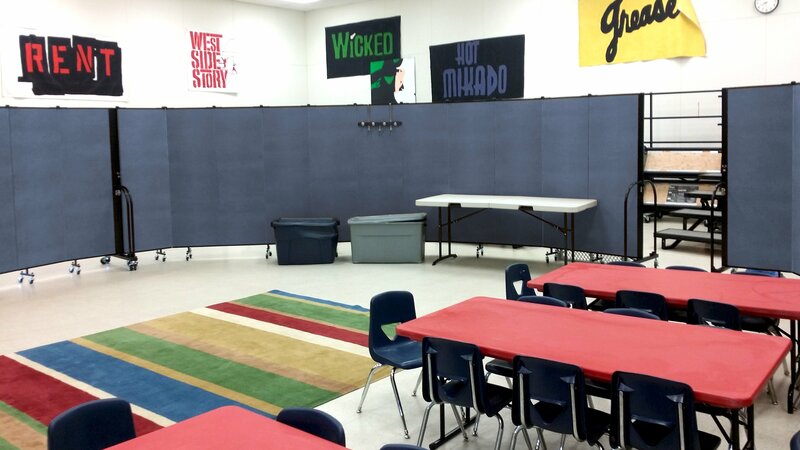 To this day, we are commonly asked what are the differences between the Standard and Heavy Duty Room Dividers and which divider should be purchased for your facility. Let’s take a look at several similarities and differences between these two product lines. At first glance, the Standard and Heavy Duty Room Dividers are similar in appearance. Both partitions feature our ¾ inch sound absorbing core that provides you up to 55% reduction of ambient noise in a room. Similarly, both rolling wall products act like a bulletin board allowing you to tack, pin, or staples securely to the fabric walls. Vinyl coverings are also available, but tacking items to vinyl is not suggested. Both sets of room dividers feature position control hinges (PCH) on the top of each panel connection. The PCHs allow the divider panels to remain in different configurations. Lastly, we are proud to say that all of our Screenflex products are made in the U.S.A. in Lake Zurich, IL and are made from 76% recycled material. But this is where the similarities stop for these two room divider products. The real differences between the Standard and Heavy Duty Dividers are in the manufacturing supplies used to construct each product line. Self-leveling casters– When moving the divider, the black self-leveling wheels absorb all the shock and bumps on even surfaces, while retaining contact with the floor. The casters swivel 360 degrees for easy positioning and set up. Stable support base– Our proprietary steel end frame evenly distributes the weight of the divider towards the floor, so you are ensured a stable divider at all times. Metal full-length hinges– Steel piano hinges are screwed into adjoining panels every four inches to provide a secure connection between the movable panels. Locking corner casters– This petal activated brake secures the ends of your room divider into position. Locking casters are not installed along full-length of the divider to allow for some give in the wall. Secure storage latch– Positioned on the base of the divider, the latch self-engages to secure all the panels together. This design feature preserves the integrity of the hinges and offers you a clear sight line when rollingthe room divider. Heavy duty leg assembly– This extra strength leg assembly supports the rigors of rolling the room divider over more uneven and rough terrain. Industrial hinges– Full-length piano hinge are used on both the Standard and Heavy Duty Room Dividers, but on the Heavy Duty Room dividers, we use powder painted Industrial piano hinges that are extra-thick and extraordinarily strong. This enhancement ensures stable walls for years of dependable use. Dual gusset plates– Extra gusset plate at the top of the divider. A gusset plate joins a connection at the intersection of the panels and the end frame to provide a stable and robust divider. Multi-unit connector- This feature comes standard on all Heavy Duty dividers and enables two partitions to be connected together, end to end, to create various lengths. Storage latch– Much like the Standard storage latch, the Heavy Duty storage latch automatically locks the panels together for compact storage and ease of mobility. However, the heavy-duty storage latch is positioned on the upper support frame making it easy to open. Robust Channel support– The Heavy Duty model has a deeper channel that wraps the panel which provides additional support. Ultimately, when selecting between a Standard or Heavy Duty Screenflex Room Divider, you must consider its intended use, what environment it will be used in and what amount it will be used. Rest assured, all Screenflex products are built to the quality and working conditions expected in a Screenflex Room Divider and are backed by a 3-year quality guarantee. For further details on these and other Screenflex products visit Screenflex.com or contact our sales consultants at 800-553-0110. Click here to download a free Standard and Heavy Duty Room Divider comparison chart.